After guiding Manchester United to an historic Premier League, FA Cup and UEFA Champions League treble the previous season, Sir Alex Ferguson was knighted for his services to football in the Queen's Birthday Honours List. And in 1999/00, Ferguson led United to the PL title for the sixth time in eight seasons when his side retained the crown by a record 18 points. In claiming the title, the Red Devils scored a Premier League high of 97 goals, which coincided with an overall record of 1,060 goals across the division. 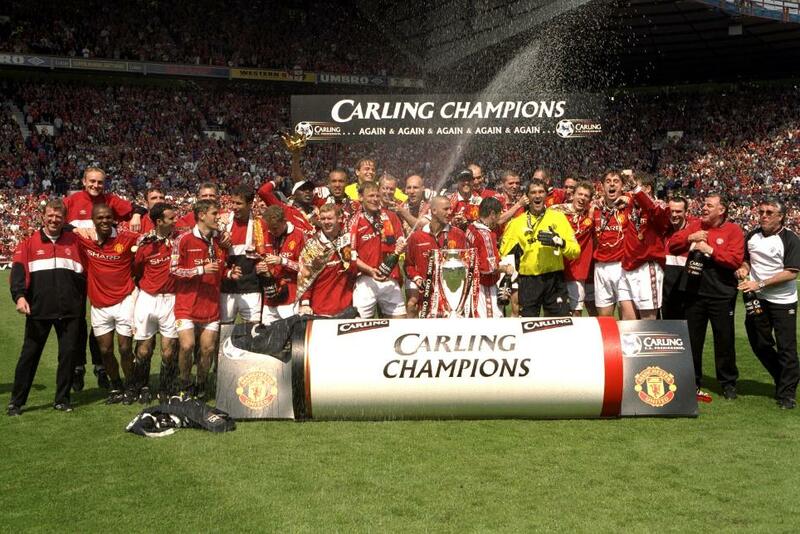 A run of 11 successive victories at the end of the campaign sealed United's title defence but few could have predicted that outcome after a number of their challengers strengthened in the summer of 1999. Arsenal, who finished one point adrift of Man Utd in 1998/99, compensated for the departure of striker Nicolas Anelka with 1998 FIFA World Cup winning France forward Thierry Henry. The charismatic Frenchman did not take long to establish himself as one of the Premier League's most lethal marksmen. A superb effort at Southampton was one of 17 league goals in his debut season. Henry could not prevent Man Utd stamping their mark on the title race in the first meeting between the two sides on 22 August 1999. Roy Keane scored both goals in a 2-1 victory for United, who were top of the table after four matches. But an error from Massimo Taibi, the replacement for departed goalkeeper Peter Schmeichel, led to them being knocked off top spot in September. The Italian keeper let a tame Matt Le Tissier shot through his legs as Southampton claimed a 3-3 draw at Old Trafford. United were replaced at the top by an exciting Leeds United side, inspired by Australian winger Harry Kewell, who went on to win the Professional Footballers' Association Young Player of the Year award, and Michael Bridges, who scored 19 goals in his debut season after joining from Sunderland in the summer. A run of 12 wins from 14 matches took David O'Leary's side to the summit over Christmas, while Man Utd were second and Arsenal were third. The Gunners were involved in one of the season's classic encounters in October when a hat-trick from Nwankwo Kanu, capped off by a superb strike that found the top corner from an acute angle, gave Arsenal a 3-2 win against Chelsea, having been 2-0 down. Sunderland's Kevin Phillips enjoyed a sensational debut campaign in the top flight. Phillips, who formed a prolific partnership with Niall Quinn, scored 30 goals in the league, earning him the Golden Boot and European Golden Shoe, as the promoted Black Cats earned a seventh-place finish. One of those goals came in a 2-1 win over local rivals Newcastle United in the early stages of the season, and Ruud Gullit was then the first managerial departure after the Magpies lost five of their first six matches. Gullit was replaced by former England manager Sir Bobby Robson, who led his side to a comprehensive 8-0 victory over Sheffield Wednesday in his first home match in charge. Alan Shearer, who had been dropped to the bench for the Sunderland defeat, was galvanised under Robson's leadership and became the second player to score five goals in one Premier League match, after Andy Cole achieved the feat in Manchester United's 9-0 hammering of Ipswich Town in 1995. Shearer went on to net 23 league goals in 1999/00 as the revived Magpies finished 11th. Newcastle were the last team to inflict defeat on Man Utd in the 1999/00 season when they won 3-0 at St James' Park on 12 February. The same day, Frank Lampard sealed a 5-4 victory for West Ham United against Bradford City, and the Hammers would catch the eye again the following month when Paolo Di Canio scored one of the Premier League's greatest goals. The Italian sweetly connected with Trevor Sinclair's diagonal ball and found the far corner with an exquisite volley. The strike came against Wimbledon, who were managed by Egil Olsen after he replaced long-serving Joe Kinnear in the summer. The Crazy Gang were consigned to relegation from the Premier League for the first time after nine defeats from their last 10 matches. The day before Di Canio's goal, Paul Scholes scored a thunderous volley from a David Beckham corner as Manchester United cruised to a 4-0 win at Bradford. Scholes followed that up with a hat-trick in a 7-1 win against West Ham at Old Trafford, and they wrapped up the title in style with an 11-match winning streak. Arsenal were runners up for the second successive season, while Leeds were the third team to secure UEFA Champions League qualification after edging ahead of Liverpool. The Reds finished fourth after a shock final day defeat to Bradford, who clinched safety as a result. 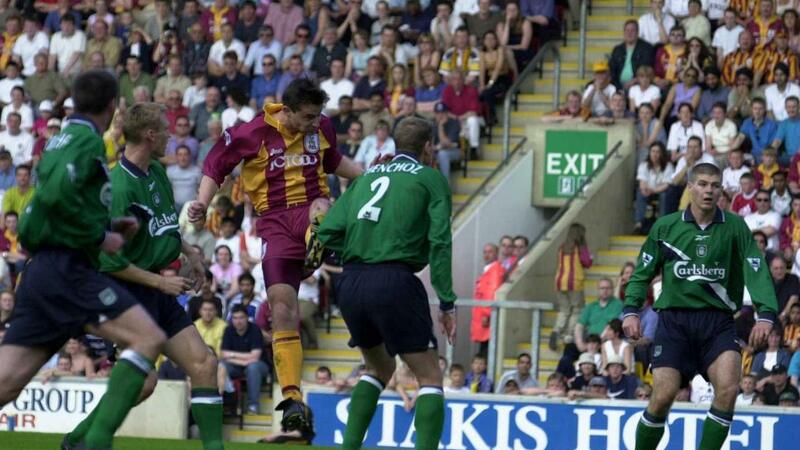 David Wetherall's header sealed the crucial victory at Valley Parade as Bradford stayed up while the relegated clubs were Wimbledon, Sheffield Wednesday and Watford, who beat Liverpool and Chelsea in the highlights of a difficult debut season in the Premier League.